HelpHound Blog: Why pay commission - when there is a better way? Consumers think they are great - the aggregator/lead generator websites - but businesses are not quite so fond of them - for good reason: they soak up money. Whatever business you are in, from hospitality to hairdressing, there is a site selling you customers. Needless to say, that's not quite what they tell their (your) customers. If you are relying on one of those sites to drive business we think you should be at the very least testing an alternative - professional review management. They promote themselves to the general public and then sell that consumer to you - usually for a commission (rates usually vary from 10% - 35% of the value of the service provided). They claim to 'add value' in various ways - and some do. TripAdvisor's reviews are useful, and so is their forum, for instance. They may provide your business with useful software (for bookings or appointments, for example). And they will deliver custom (because their business model depends on that, at least). But all this comes at a price, and while it may sometimes be a price you are willing to pay, just like any marketing, if there is a less costly alternative, you will want to know about it. Professional review management delivers most of what your potential customers want from these sites: reassurance that they are choosing the right hotel/hairdresser/estate agent/plumber - and it delivers the customers to you with an important difference, and that difference is mostly in the way the business pays. The commission model goes right out of the window - so you don't end up paying more and more for every customer. Your business is rewarded for success, not the introducing website. How much does your business need to earn to pay back our fee? Put simply: if HelpHound membership generates a single customer a month more it has paid for itself - any more than that - and the business is in clover. 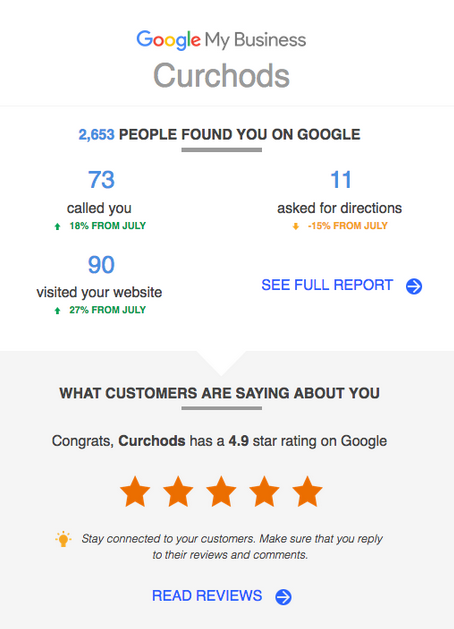 Both these screenshots were taken directly from the respective business's own Google My Business report. Every business is sent this every month - so any uplift is immediately apparent. In both these cases the only variation in the business's marketing plan was the adoption of HelpHound (that, perhaps unsurprisingly, is why they have shared these reports with us). So: whatever your business, join HelpHound and have us working alongside any other solution you currently have in place and see for yourself the value we can add - and there's no minimum contract period, that's how confident we are that you will be glad your business joined.